When Lee Anderson opened the Light Club Lamp Shop in 2014, he didn't intend for it to be a music venue. Instead, he envisioned the extension of his Burlington-based coffeehouse/music venue Radio Bean and adjoining street-fare restaurant ¡Duino! (Duende) as "more of a conversational lounge." "I was trying to break the 'altar' aspect of hanging out at Radio Bean — meaning that everyone stands shoulder to shoulder facing the stage," he says. "I wanted to have a community spot that wasn't necessarily stage-focused." Best intentions aside, the radiant cocktail bar has since become just as much a live music venue as its sister space. But two nights a week, it offers something that fits Anderson's original vision — sort of. Every Friday and Saturday, the Lamp Shop converts to a full-blown discotheque. 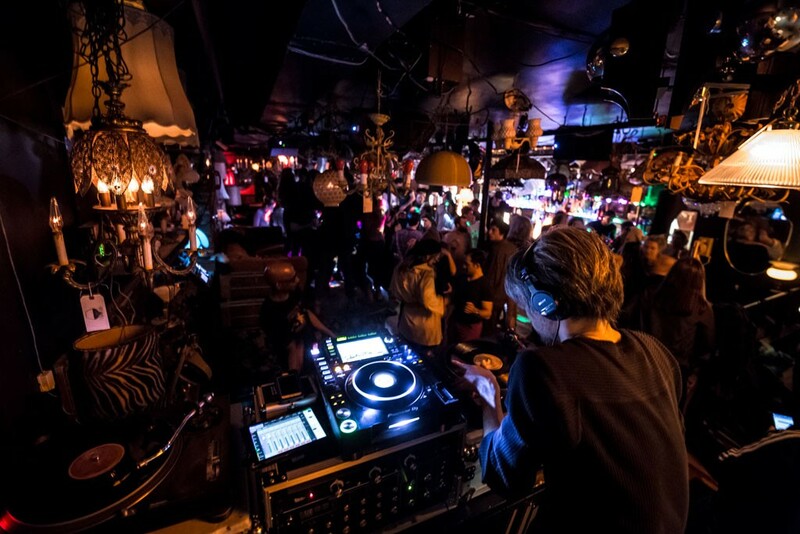 Resident turntablist DJ Taka keeps the beat with old-school, often obscure disco and early house music. Full name Takahiko Matsui, the 40-year-old Japanese expat appeared in Burlington seemingly out of nowhere in 2015. Almost immediately after taking up his residency, buzz about his skills and selection were a hot topic of conversation among late-night revelers and DJs alike. Practically overnight, Matsui had cultivated a loyal following and one of the most stimulating dance parties in the Queen City. This weekend, he not only takes on his regular Friday slot but closes out Radio Bean's 18th Birthday Bash on Saturday, November 3. Despite the debauchery he incites, Matsui is bashful and exceedingly humble. Part of his timidness relates to his lack of confidence in conversational English — though in talking to him you get a sense that he's always been a bit of a shy guy. He speaks softly, frequently tucking his gray-streaked black hair behind his right ear. Matsui got his start deejaying in his teens in Osaka's club scene, spinning mostly rap. "At the same time, I wasn't really into hip-hop music," he says, despite having rubbed elbows with many noteworthy artists during his time there. "It was easy to meet lots of American hip-hop musicians in my town," Matsui recalls. "I [was] most impressed [with] DJ Premier and Gang Starr." DJ by night, Matsui served as vice president of a cosmetics company by day. But in 2014, after finally obtaining a green card, he decided to leave the company to follow his heart. He landed in White River Junction along with his American partner, whom he'd met and begun a relationship with years earlier in Japan. "[But] I couldn't find a job there," he laments. After about nine months, Matsui moved by himself to Burlington and began working at the Diggers' Mirth Collective Farm at the Intervale Center. How Matsui ended up snagging his residency is a brief but serendipitous tale. Brian Nagle — aka DJ Disco Phantom and one of the most in-demand local DJs — saw Matsui play a set at a private party. Impressed by his skills and selection, Nagle passed the tip on to Anderson, who needed someone to fill a slot for a special event at the Lamp Shop. "He blew my mind," says Anderson. "The second he ended, I said, 'Hey, do you want to deejay here every Friday and Saturday night?'" "I wasn't thinking I was going to [deejay] when I moved to this country," says Matsui. "Unfortunately, [it was] hard to find a better job." Matsui creates a unique sonic space in the Lamp Shop, though it's not the only place to get funky on the weekend. His sets have a vibrant, organic feel. Deep cuts from artists such as RAH Band and Dee D. Jackson mix and blend into a hypnotic, glittery haze. "[A lot of club] music is so quantized," says Nagle. "[Taka] plays records that are very musical. If you were in the other room, you might think a live band was playing." Matsui typically brings four crates of records to his residency — approximately 400 discs. He claims his collection totals approximately 15,000 records total, including a large portion he keeps at his parents' house back in Japan. And though he mainly mixes vinyl, he uses digital media, as well. "Lots of people [assume] that vinyl sound is best," he says. "But it's totally not true. Of course, it's great sound. But I sometimes choose digital because it doesn't get shaken with vibrations [like vinyl does]. "I don't want people to think the laptop DJ is not good," he continues. "I can do the same thing with high-end digital media." Matsui says that when he first started his residency, people would come into the DJ booth, tap him on the shoulder and make requests. But now, three years on, he says he feels like his audience is more attuned to his artistry and lets him do his thing uninterrupted. "It's a really positive and accepting vibe," says self-proclaimed DJ Taka superfan Chris Dubin. "I just happened to be there one of the first times he was deejaying. His ability to play to the vibe or feel of the room and not just kind of force music on the audience is quite spectacular." 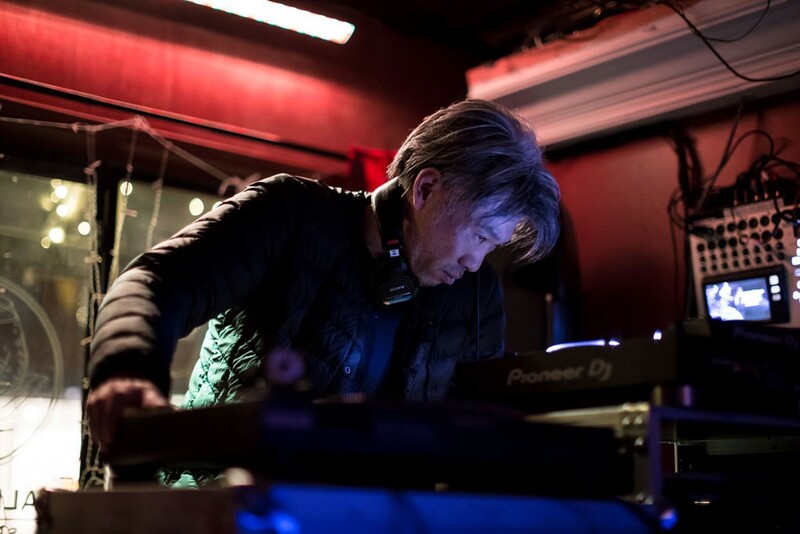 Not just a DJ, Matsui is also a classically trained pianist and serves as beatsmith in Anderson's experimental disco-punk outfit Appalled Eagles. Similar to how a DJ extemporaneously creates a set, the pair enters its live shows with only a loose idea of each song's structure and groove. Typically, Appalled Eagles is just Anderson and Matsui on synths and beats, respectively — though in 2017, they enlisted a horde of others for an epic midnight set during the Waking Windows music festival. "When it's just Taka and I, I find that we're able to modulate and adapt really quickly and improvise a bit more fluidly," says Anderson. The nuance of English is always tricky for Matsui. That's especially true when working on music. "If I want to change the bass line, I can't say it," he says. "But I can show the difference." Matsui lives and breathes music. He listens to thousands of tracks per week, always searching for fresh tunes. Consequently, he has a reputation of being a compendium of knowledge. "If you want to talk about what's the best gospel music, or best folk song, or '80s synth hit, or '90s indie rock — he knows all of that stuff," says Anderson. "He's not just knowledgeable about disco." Matsui says he often borders on obsessive. "That's been a problem, because I usually forget to eat or go to sleep," he admits. "That's bad because I easily get sick." However, he's only had to skip out on his residency a handful of times in three years. Nagle is happy to step in on those rare occasions. "It's really exciting because I know people are coming to hear disco, which doesn't happen anywhere else in town," he says. "I get to play records that wouldn't go off anywhere else." What's most impressive about Matsui's tenure is that he achieved local-legend status largely by word of mouth — he only recently created a Facebook page. Anderson credits the unique culture the DJ fosters at his residency as a key to that success. "Even though somebody could play almost the exact same set, it's something about the feel that he has when he's doing and how he EQs it," says Anderson. "If you watch him, he really plays the track in this alive way that I think is really special. He takes crazy chances, which is part of the way that he's built culture." The original print version of this article was headlined "The Spins"